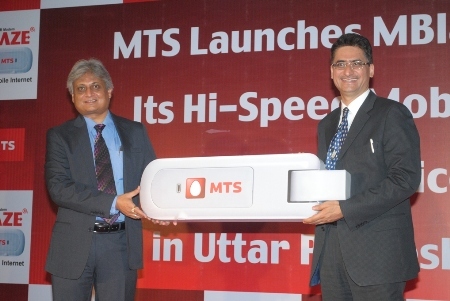 Sistema Shyam TeleServices Ltd (SSTL) better known as MTS, have announced the launch of its high-speed mobile broadband service, MBlaze in UP East & UP West Circles. The MBlaze services are now available in Lucknow, Allahabad, Kanpur, Dehradun, Aligarh, Agra, Bareilly, Gorakhpur, Meerut, Moradabad and Varanasi. The service will be supported by a network of 5000 retail outlets and over 50 company flagship stores. The retail network has been rolled out to offer greater convenience and enhanced customer experience to both voice and data customers of MTS India. The Company has an introductory offer of unlimited data usage at Rs.999/- for 30 days. Also a one day sachet pack with unlimited data usage at Rs. 96/- User can also use their MBlaze dongles and HSD (High Speed Data) compatible handsets to enjoy video streaming, High quality audio/video download and live play back. With MTS TV, customers can watch over 80 LIVE TV and on demand Video Channels. The customers will get access to a range of News, Entertainment, Sports and Regional channels.